I am Hideo, the leader of Shinkageryu Kenjutsu Tsukikage Juku. My job is an instructor in Shikageryu and a violin instructor. 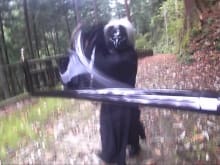 You might suppose Kenjutsu is different from violin at first sight, but they are similar about body controls. We don't use muscles but use nerves. For example, when we relax muscles, the body relaxes but the nerves don't relax. This is common to ways of playing the violin. Thirty have have passed since I started Kenjutsu, and fifteen years have passed since I encountered Shinkageryu; my important method of Kenjutsu. Not cutting with sword is the core of Kenjutsu, and this law exists in Shikageryu. I am past fifty and feel that I haven't touched the most profound ideas of Shikageryu, but I want to explore Shikageryu more deeply. Amazing experience, ton of fun! I came to this class alone and with zero knowledge of any martial arts. And I did not regret it all. Watching them doing demonstrations before we started is like watching Samurai filem. Each movements is artistically done. And when it is my turn to try, I realised, those gentle yet powerful movement is not for the ordinary., but everyone can learn and master it. Taking out and putting the sword back is not easy. I can relate most of the movement to my daily routine. And I wish I could have spent more days to practice this beautiful art. It is a very good intro to new comers or who wants different kind of holiday. If only I get the chance to dress like Samurai!!! We were three friends who took the Shinkage-ryu workshop together. Since we come from different cultural, educational, and genetic backgrounds we each experienced the workshop differently and because of that we have three different reviews in one. Participant 1: The Shinkage-ryu experience was very interesting and enjoyable. Kamata-san was an engaged and interesting teacher and we were able to spend a lot of time in actual practice. It is a “secret” martial art and more unique than the regular Karate, Kendo experiences. Highly recommended! Participant 2: I found the Shinkage-ryu experience enjoyable both as an activity and an informative seminar into an obscure martial art. Shinkage-ryu combines Japanese swordsmanship with very elegant movement. It is wonderful to watch and practice. Kamata-san is an absolute master with a great sense of humor that makes the experience a delight. I understood 80% of what was being said as some Japanese was mixed into the instruction. That though did not impede any part of the instruction or the exhibition. I highly recommend it to both tourist visiting and expats living in Tokyo. Participant 3: I happened upon the 新陰流 (Shinkage-ryū) workshop whilst looking for cultural experiences that might be interesting for some friends who were going to visit Japan. I found the workshop and the concept of 新陰流 to be different from other 剣術 (kenjutsu) and after sharing with two friends, we all agreed to sign up. On the day of the workshop we were greeted by 芹沢先輩 (Serizawa-senpai) who escorted us. Our workshop location was at at community centre where 鎌田先生 (Kamata-sensei) and other practitioners of 新陰流 meet regularly to practice and learn. Honestly, I was not entirely sure what to expect of the workshop especially since I had arranged it as belated birthday presents to my two friends. In addition to experiencing some of the fundamental bodywork first hand, we discussed the philosophy of 新陰流 which is about the heart, about being equals, and about the importance of converting a weaponised encounter into one of peace. We enjoyed the experiance but it was very unprofessional that we didn't understand the guilds as they did not speak English. Our training session yesterday was incredible! I have trained some kenjutsu over the past year at home, and I found it very rewarding to learn new techniques and fundamentals in A setting with direct contact with a master! My friend joined me as well who had no martial arts training, and their patience and instruction made it a joy for him as well! I will definitely be back to train with Sensei again!